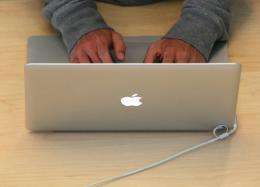 A man types on a MacBook laptop in San Francisco in May 2011. A bill intended to increase sharing of information about cybersecurity threats between government and the private sector was introduced in the US House of Representatives on Wednesday. A bill intended to increase sharing of information about cybersecurity threats between government and the private sector was introduced in the US House of Representatives on Wednesday. "There is an economic cyber war going on today against US companies," said Republican Mike Rogers, the chairman of the House Intelligence Committee and a co-sponsor of the Cyber Intelligence Sharing and Protection Act. "Economic predators, including nation-states, are blatantly stealing business secrets and innovation from private companies," Rogers said in a statement. "This cybersecurity bill goes a long way in helping American businesses better protect their networks and their intellectual property," he said. Unveiling the bill at the National Cable and Telecommunications Association headquarters here, Rogers said it "will be the first sentry on duty to make sure that the Chinese, the Russians, the Iranians, other nation states, individual hackers, thieves are caught before they penetrate our systems." Democrat Dutch Ruppersberger, a co-sponsor of the legislation, said "sharing information about cyber threats is a critical step to preventing them. "This bill is a good start toward helping the private sector safeguard its intellectual property and critical cyber networks, including those that power our electrical, water and banking systems," he said. Anticipating a potential backlash to the legislation from digital rights and privacy groups, Ruppersberger said the bill "maintains vital protections for privacy and civil liberties." The bill would grant the government the authority to share classified cyber threat information with approved US companies and encourage US businesses to share threat information with the government on a voluntary basis. The bill has received the backing of US cable, telephone and wireless associations, the Information Technology Industry Council (ITI) and other groups. "This legislation enables the intelligence community to more effectively share actionable information about cyber threats with the private sector," ITI senior vice president Ralph Hellmann said. "While the Internet is largely owned and operated by the private sector, the government often has unique intelligence on cyber threats," Hellmann said. "Ensuring that the government's intelligence information is shared in real-time with those in the private sector who can act on it is critical to improving the security of cyberspace."